December is always one of our favourite months in Reception for one reason… CHRISTMAS, of course. We have absolutely loved preparing for this special day and it really has been a magical experience for us. We have loved writing our Christmas lists to Santa and posting them in our post box. Some of us have even pretended to be post men, delivering Christmas cards to the children in class. We have loved pretending to prepare and eat Christmas dinner in our home corner and have had particular fun in the photobooth area, taking photographs of our friends. As always, we have loved all of the stories that we have read throughout December. We started off the month with ‘The Elves and the Shoemaker.’ We loved that the elves helped the poor, old man by making shoes for him. Look at some of the amazing writing we did. Just after reading this story, both Reception classes were sent cheeky elves, all the way from The North Pole. They were sent by Father Christmas to watch us, but they have been very very cheeky. 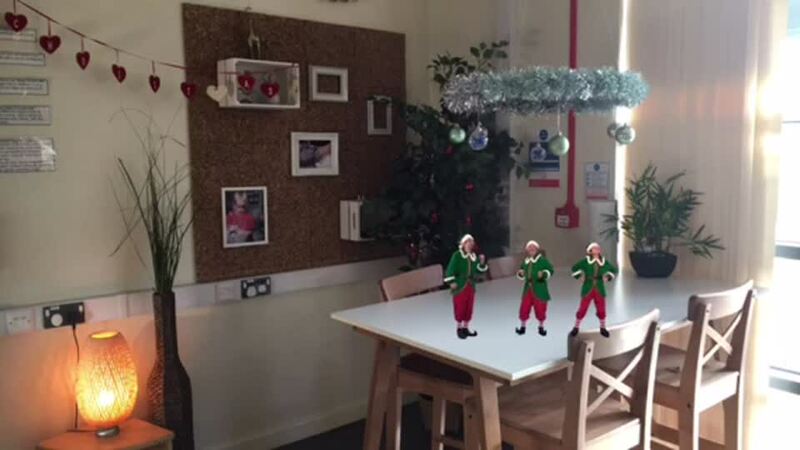 When we go home at night time, our cheeky elves come alive and do silly things in the classroom. 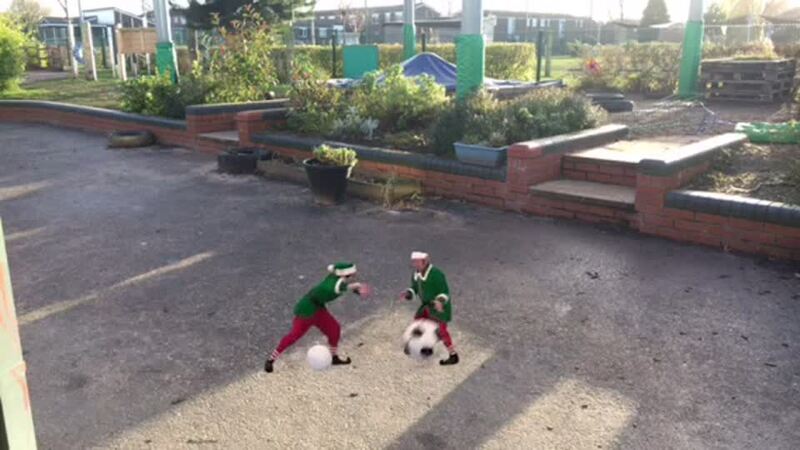 We have loved coming into school every day and checking the CCTV cameras to catch the cheeky elves in action. Don’t worry though, we have been writing letters to Father Christmas every day and letting him know what they have been up to. Another one of our favourite stories has been ‘Stickman’. We even had a visit from Santa himself, asking us to help Stickman. Stickman kept being mistaken for a stick, when he is not just a stick. He is a stick MAN. First of all, we had to go on a hunt around school to find a bat, a stick, a pen, a flag and a nest, so stickman wouldn’t be mistaken for them again. We had a fantastic time searching the school and following clues to find everything. Santa asked us to write a list of all the things Stickman is not, so he doesn’t get mistaken in the future. Look at some of our fantastic work. We also wrote about the different people who thought stickman was a twig. We have been working really hard with our writing. We have also worked super hard this year on our Christmas performance. This year, we went for a modern day Nativity and sang some of our favourite songs. Our parents were so impressed with our performance. November has been a really fun month for us in Reception. We have really enjoyed all of the different stories that we have been reading. One of our favourites of the month has been ‘Jack and the beanstalk’. When we arrived into school one day, we were so shocked to find that a beanstalk had grown in our classroom and we worked out that someone must have left some magic beans in the class. We then followed instructions to plant our very own beanstalks, but this time we didn’t use magic beans. We have really enjoyed looking after our beanstalks and watching them grow. We then wrote up some instructions explaining what we did. The children are doing amazingly well with their writing and we are super proud. In maths, we have been looking at length and height and doing lots of measuring. One morning, we came into school and found lots of different sized footprints around the classroom and we had a voice message from the giant explaining that he had been into our classroom and had set us lots of different challenges. Some of the children became detectives, measuring the different footprints and discussing which ones they thought belonged to the giant. Others had to sort out a bag of mixed up clothes, matching them to the giantess, Jack and a doll. The children had to talk about the size of the clothes and use problem-solving skills to determine who they belonged to. We had lots of fun! We have also really enjoyed reading the story ‘The Snowman and the Snowdog.’ One day, we found a melted snowman on the floor with a book and we were super excited to read it. Once we had read it, we did lots of amazing writing, describing the characters from the story. 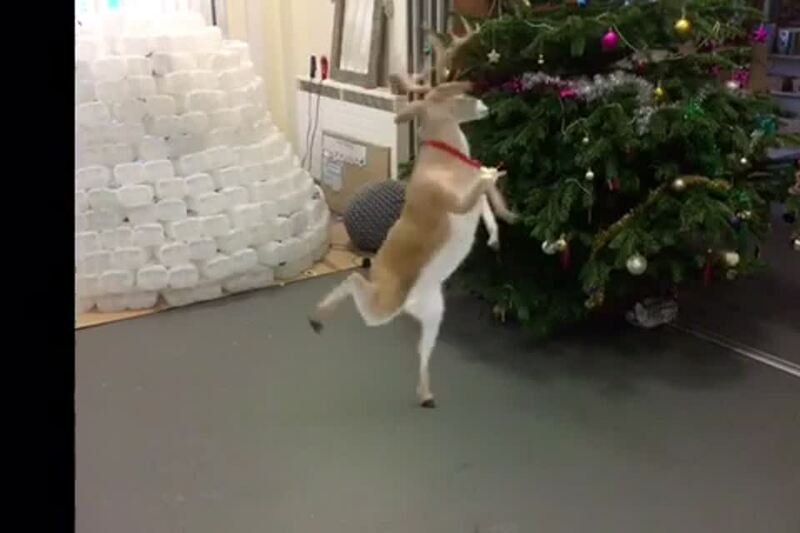 We are really looking forward to December and getting in the Christmas spirit in the run up to Christmas. We were thrilled to reveal our new outdoor classroom to the Nursery and Reception children! With support from a National Lottery grant we have worked with E.den Play to re design and develop our Early Years outdoor space. The new area has a natural water play area including pump, reading corner, sensory garden, changing area and amphitheater style seating. We have also enhanced some of our older structures including the gazebo, mud kitchen and story circle and have had the area landscaped with new turf making the whole space more inviting and creating specific areas and an abundance of learning opportunities! October has been a very spooky month in Reception! After school on Halloween, Reception held a parental enrichment. Children came along with their families and friends and made toffee apples and ghost pictures. Also in October was our amazing Dr Dolittle Day! This was a whole school day that everyone was involved in. All the Reception children and staff joined in by dressing up for the day! There were; vets, animals, explorers and may others. All the children looked amazing. The day comprised of a number of different fun activities. Firstly, there was a visiting farm. Here the children met the goats, sheep, chickens and ducks and they were even given the opportunity to feed them. Then the children went to pets corner where again they had the opportunity to handle the animals. There were rabbits, a tortoise, guinea pigs and even a stick insect. Following on from Dr Doolittle, the children learnt all about the book Farmer Duck. This was a story about a lazy farmer who made the duck do all the farm work. Until, one day all the other farm animals decided it was not fair and worked together to get rid of the farmer. The children got really involved in the book. They talked about how the animals felt, acted out scenes from the book and even described the characters from the story. October has been a fun month. September has been a very busy month in Reception! All the new children have settled in really well and have enjoyed exploring their new classrooms and environment. They have been busy making new friends and enjoying seeing friends from nursery who they have not seen over the summer holidays. In maths the children have been learning about shapes and exploring our indoor and outdoor environments to looking for everyday shapes and creating pictures with shapes. The children have also been doing lots of counting and matching numbers to quantity. They have even been enjoying playing some traditional board games to practice their maths skills such as; snakes and ladders, bingo and dominoes. The children have loved playing these with their friends and have showed some great turn taking and team work! There has also been some very strange activity within the classroom. One morning the children came in to find that there were huge footprints throughout the classroom! When they investigated further, they found large boots and clothing which belonged to the ‘Smartest Giant in Town.’ The children then read the book and learnt all about the characters in the story. The children even completed some writing tasks based on the story. We read the story then decided that we would have a tea party just like the characters in the story. So we have had a week planning what food we want for the party, writing shopping lists and instructions of how to make sandwiches and then we had a tea party with our teddies brought in from home and the teddies in our classroom. Welcome to the Reception Class blog. Here you will find lots of information about what the Reception children have been doing during their time in school and we do hope that you will enjoy reading it. Mrs Burland, Miss Connolly and their team are looking forward to an exciting first half term in Reception and are looking forward to welcoming all the children into their new classes. Mrs Burland, Miss Connolly, Michelle, Kirsty, Karen and Maxine. 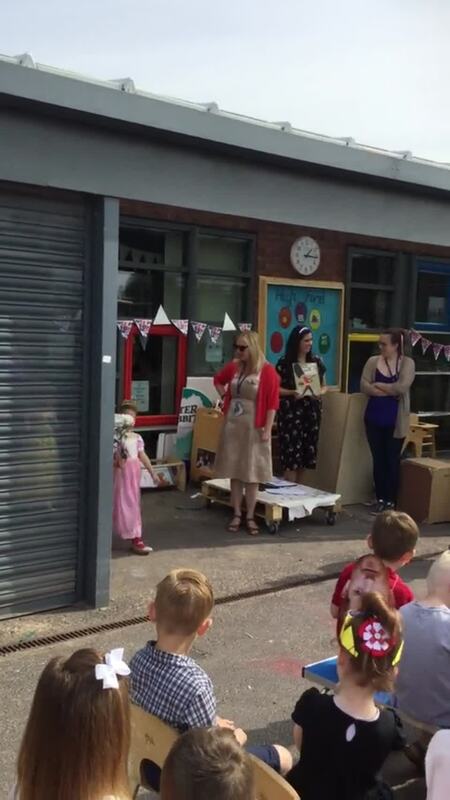 Reception took part in their very own royal wedding. All the children and staff dressed to impress for this special occasion. After the event the whole school enjoyed a Royal Tea Party and raised a glass of juice to Megan and Harry. April has been a fantastic month for us in reception. We had our very own duckling eggs in our class and we watched them hatch. We then looked after them in our classroom and they were so cute. We made sure they were clean, we gave them water and food and of course, we gave them lots of cuddles; that was our favourite part! We even let them have a splash in our water tray and watched them swimming about. We also went on a fantastic trip to Underwater Street: Imagine That. We became scientists and it was great fun. Here we are making giant bubbles. We also made our own slime, magnets and bath bombs. We even met a real scientist who showed us how to do all these things. We had lots of chocolaty fun during March as we focused on the story ‘Charlie and the Chocolate Factory’ and found out about Roald Dahl. On world book day, we all dressed up as our favourite characters and went on a clue hunt around school to find the chocolate that Willy Wonka had left for us. On our clue hunt, we found out all about Roald Dahl and it was lots of fun. We also made our own chocolate cakes and even had a candyfloss machine in class; it was so yummy. Willy Wonka wanted our help. He ran out of ideas for chocolate bars and wanted us to design and make our own. We tasted and chose different ingredients, made the chocolate and even wrote some instructions about how to make it. Then we ate them, yum yum yum! We also had a special ‘Around the World’ day and reception looked at Kenya. We had lots of fun making African jewellery, doing African printing, learning African dancing, tried some African food and even had some experts come in and teach us African drumming- it was so exciting. We also learnt about what it would be like to live in Africa. We learnt about how they have to walk for a long way to get water from a well and that lots of people in Kenya live in mud huts. We had fun pretending to live in Africa and even had our very own mud hut. February in Reception was yet another fun filled month! One exciting event that all the children got involved in and really enjoyed was Chinese New Year!! First the children learnt about the story as to how each year was named. This was the story of The Great Race where 12 animals took part; a rat, ox, tiger, rabbit, dragon, snake, horse, goat, monkey, rooster, dog and pig. The children loved the story of the race and they particularly enjoyed learning about which animal represented their year of birth. Following this the children then had a Chinese food tasting session. They tasted prawn crackers, rice, sauce and noodles!! This was so much fun! The children loved the food so much that some of them created their own Chinese food plates using different materials from our creative area. Delicious! The children enjoyed writing about the animals in the story and what each animal got up to during the Great Race! Also in February, the children have become Scientists! We now have our own Investigation Area within the classroom where the children can investigate and explore lots of exciting things. In February the children learnt about magnets and they loved experimenting with these, discovering what items have magnetic properties. The children have loved this area. As the weather starts to improve, the children have enjoyed exploring the outdoor classroom! We have had a great month in Reception. This month in Reception has been very exciting. The children were so lucky to be part of the amazing Winter Wonderland Day that took place. During the day the children took part in a range of fun activities including; ice skating, meeting real reindeers, having a snowball fight, face painting, bouncy castle fun and meeting Anna and Elsa from the film Frozen! Anna and Elsa singing! Winter Crafts. In literacy we have been learning the story of Jack and the Beanstalk. The children have loved this story. They even had a visit from the giant as he left his boots and the beanstalk in our classroom. Despite the children searching for him and writing wanted posters to try to help to find him, we think he must have returned to his castle! Since his visit, all the children have planted their own special bean and they are now looking after it by making sure it is watered and placed in the light. We are interested to see if any of them will turn into a magic beanstalk! The children have written a list of what they did when they planted their own bean. Also in literacy the children received a newspaper report to tell them that some animals had escaped from the zoo. The children have hunted everywhere to find them and make sure that they were safe. They have created their own posters and put them up around school to tell others to look out for the escaped animals! The animals have even been in our classroom as they left their footprints! January has been a very busy but fun month. We have also had some cheeky elves in our class who have been getting up to mischief. 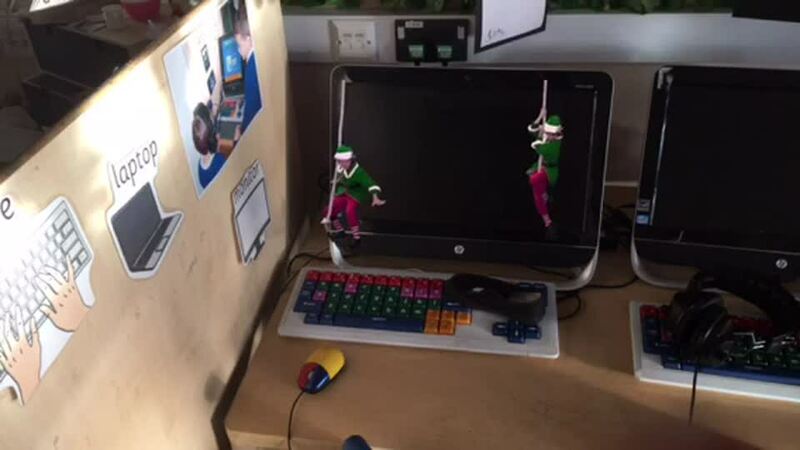 We have even had an elf cam in our class and we have been watching videos of what the elves have been doing when we have been at home. Take a look at the video’s, they are very cheeky. One night, reindeers came into our class as well. They left some chewed up carrots in our classroom. We had so much fun watching these videos. We worked extremely hard learning our lines and all the songs for our Nativity and we did a fabulous job. Our mummies, daddies, nannas and granddads loved watching us and our hard work paid off. We have had lots of fun this month in Reception. We have loved playing in our new vet area, writing on X-rays, making appointments and looking after the animals. In maths, we have been looking at length. We have been measuring different things in the classroom and working out which items are the longest and which are the shortest. We have had lots of fun doing this. We also had a visit from fire fighters and they even brought their fire engine into school. We learnt about all the different things that fire fighters do and even had a go with the hose. Everyone enjoyed it. Since starting Reception, we have been having lots of fun getting to know our new teachers and friends. We have enjoyed exploring our new classroom such as role playing in the shop and home corner. We have used our imagination to become pirates in the pirate area and have loved choosing our own snack and have even washed our own plates afterwards. We have been walking sensibly and quietly along the corridor to eat our dinner in the big hall and have enjoyed trying lots of new foods. As well as all the fun we have been having in the classroom, we have also been out in our community buying healthy snack for all our friends to enjoy in class. We worked as a team to carry the food to the till and we used our manners when paying. We have also started to learn some phonics and have loved applying our skills both indoors and outdoors. We have been doing some messy mark making outside with water and sand and have been practising writing our names. This month in reception has been a warm one! The children have loved the better weather and enjoying all the fun activities in our outdoor classroom. There has been lots of water play, digging for treasure and doing both maths and literacy outside. Then Mrs Burland needed the children's help. It was her birthday but she did not have time to plan a party. So the children set to, writing shopping lists, party invitations , ideas for party games and all things party! They decided that they wanted a pyjama party so they made plans and a pyjama party was what they had. They all came in to school in their pyjamas as well as the teachers and had a fun day. Mrs Burland was very happy with her well planned party! being sat all cosy on the carpet! Our classroom has seen a few changes during the month of May. We now have a coffee shop, an ice cream parlour, a jungle, bee bot toys and a super hero city! The children have been enjoying these new areas. The girls taking orders in the coffee shop. The boys enjoying programming the Bee Bots. Also this month we have been practicing for Sports Day. The children have been taking part in fun races such as relays, egg and spoon race and running. We have even managed to practice outside too on a couple of occasions in the sun. May has been fun! We are all looking forward to June!! This month in Reception we gained 8 new friends! Chicks! When the children returned after the Easter holidays, they were met by an incubator in the classroom with eggs! Every day the children observed the eggs, writing down what they could see and making sure they whispered near them so not to disturb the chicks inside! Then they begun to hatch. The children were so lucky as they all saw the first chick hatch. Starting with a tiny crack in the shell to a few hours later a little chick. She was named Isabella! Following her birth over the next few days a further 7 chicks were born, 3 girls and 4 boys. The children learnt how to tell which ones were boys and which were girls. Over the week and a half period that the chicks were with us the children looked after them by feeding and watering them and they also had the opportunity to hold them. On a couple of occasions we were able to let a couple of the chicks walk around on the carpet whilst the children sat around them in a circle. They loved to watch them and were particularly amused when one did a poo on the carpet! Also this month we went on a Woodland Walk which we all loved despite at one point being stuck in a downpour of rain. The theme was to explore and find minbeasts in the environment which was a success. Children found worms, caterpillars, snails, spiders among others. We then continued to walk around the woods and the parkland area enjoying all the sights and the sounds. The children's behaviour was amazing making Mrs Burland and Miss Crompton the proudest teachers. Well done Reception. On our way! Exploring for mini beasts. The girls sprinkling fairy dust by the fairy door in the tree. March has been a very exciting month in Reception and the children have all worked very hard and deserved their Easter break. At the beginning of the month the dinosaur eggs which were in the classroom began to crack. The children observed them daily, drawing pictures and writing messages for the dinosaurs inside. Then on World Book Day the eggs hatched! The children arrived at school in the morning, all dressed as explorers to be met by a huge T-Rex walking around the playground roaring at everyone! He was a very friendly dinosaur called Rex. Later that day the children went into the hall where fast asleep, wrapped in blankets, cuddled up with their keepers were two baby dinosaurs! Junior the baby T-Rex and Trixie the baby Triceratops. The children were given the opportunity to ask questions about the dinosaurs and they even went up to them to touch them and see what they felt like. All the children loved doing this. Then a week later, something really strange happened in school! A spaceship crash landed in our hall! All the children were called into assembly where they saw a spaceship in the corner and the teachers were walking around in crime scene suits checking out what had happened! The children then had a challenge which was to design a home for the alien! Then on Red Nose Day all the children came in dressed in their own clothes and most of them wore red. Then they all took part in a school dance which can be found on our website. They all had a really fun day as well as the teachers! Then our Easter celebrations meant some exciting challenges. The children loved getting involved at home, creating egg scenes for the Easter Egg Competition. Reception's entries were truly amazing and one entry from Reception A even won the best design for the whole school!!! Well done. Then on the last day of school, the children came in dressed up for a Neverland Party. This was a perfect end to our Spring Term! This month the Reception children have had lots of fun and a few surprise visitors! At the beginning of the month the children were learning all about Jack and The Beanstalk. They all planted some magic beans in pots and made sure that they were watered and put in the sunlight. The next morning a huge beanstalk had grown in the middle of the classroom and a giant had climbed all the way up!! The children loved planting their beans and most of them have grown into little plants. They will next be replanting them outside and we will watch them grow. The next surprise were 2 dinosaur eggs! The children came into school in the morning and a dinosaur had laid her eggs in our classroom. The children have looked after them ever since, not talking too loudly and making sure that the nest has enough straw in it to keep them warm. Some of the children have even written their names next to the eggs so that when the dinosaur comes out, it will know their name! Over the last day or so the children have noticed that the eggs are starting to crack! They can't wait to see what happens next! The children have also been enjoying our new 'Potion Station' where they can mix and stir many different ingredients, measuring them out carefully with spoons, measuring pots and jugs! Finally, the children have loved being outside again. The sun seems to have shone a little more and even though it is cold, the children are loving exploring the outdoor area once again. This month in reception the children have settled back into class following the Christmas break. 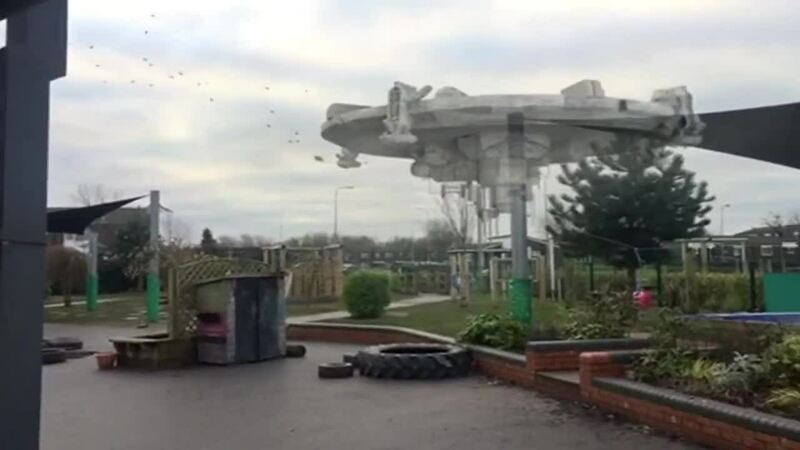 The children watched some cctv of a spaceship flying over school. The next day the Alien's spaceship crash landed into our classroom!!!!!!!. They then had to go on a hunt looking for lost aliens and write lots of posters to help people find the alien. The children had amazing fun! We are now learning all about space. Today we even watched a video of the first ever man to walk on the moon!!! It was exciting. We all tried to walk like Spacemen?!!! The children have been celebrating Chinese New Year. They have learnt all about the Chinese New Year race and then spent time tasting different Chinese foods which they loved. They tried rice, prawn crackers, noodles and dips whilst watching a Chinese parade. All the children thoroughly enjoyed themselves. This month in reception has been a very exciting time. We spent a lot of time practising for our nativity which we all really enjoyed as well as those who came to watch us. Some children even went with the teachers on the bus to the garden centre to choose 2 Christmas trees for our classrooms. We met Father Christmas in the grotto in school and we all got a present. We have also had a Christmas party where we played lots of fun games. Our parents have been to school to watch us do some writing. We all wrote our wish lists for Father Christmas. This month has been a very exciting month for Reception. We learnt about the story, Alice in Wonderland and our classroom was transformed into Wonderland! We did many exciting activities such as helping the Mad Hatter find all the pieces of his pocket watch and making magic potions to help Alice. We even had to write shopping lists for our Mad Hatter’s Tea Party! We all got dressed up for the party as characters from books and even our teachers got dressed up too! We learnt so much and has lots of fun too! Reception have had a fantastic first term! On the last day of term, both classes came in fancy dress to celebrate the schools 10th birthday. They spent the day having fun with their friends and enjoying the Circus themed fun fair! Happy Birthday Platt Bridge! Our Reception classes have been settling into their new classes over the past 3 weeks. They have been learning about our ‘Golden Rules’ and what is expected of them now that they are in Reception. They have been meeting their new teachers and teaching staff as well as making lots of new friends. They have all thoroughly enjoyed exploring the outside areas, particularly as it has been really sunny as well as finding out about the exciting areas in their new classrooms. Children have been learning about rhyming words and letters sounds as well as counting and even healthy eating. Friday afternoons have been particularly good fun. Children are awarded for their excellent behaviour and hard work and can get involved in fun activities such as; decorating biscuits, party games outside and colouring activities. Well done Reception A and B for settling in so well..
We recently visited Knowsley Safari Park and had a fantastic day. We drove through the Safari Park and spotted lots of different animals such as monkeys, zebras and different kinds of deer. We also watched a Sea Lion show and really enjoyed seeing all the tricks they could do. They could clap, wave and jump out of the water. We were all very brave and went in the bat cave. We saw lots of bats flying around. We even watched a bird show and went on the park. At the end of the day, we had a talk from a lady about lots of other types of animals like snakes and cockroaches and we were even allowed to touch the animals. We had a fantastic day and all really enjoyed seeing our favourite animals. Since we came back from the Safari Park, we have all enjoyed playing in our Safari Area in class and doing lots of fantastic writing about our day. This week has been Eco Week and Reception Class have been very busy learning about how to look after our environment. We have had an “Unplugged” morning; where we didn’t use any electricity. We had a visit from the Water Safety Team and Wigan Council, who taught us all about how to reuse and recycle. We also learnt all about flowers, birds and bugs and went on a nature walk with Russ. On Friday we planted our own flowers and watered our lettuce and tomatoes in the school allotments which we look forward to eating as our snack later in the year. Reception have had a busy term, we have been doing lots of learning and making memories. We have been using our environment to show our teachers what lovely work we can do independently. We really enjoyed our trip to Joe's chip shop where we learned all about how fish and chips are cooked. We were allowed to go behind the counter and look at the kitchen! We were then asked to enter a competition to win a free family meal, we had to design a poster for Joe to use in his chip shop, Joe chose Codie Boffey as the winner! Well done Codie! As part of our Sport's Relief project Reception have has a very special visitor in school, Kyle Shelford, who plays for Wigan Warriors came into school to talk to us about the Hakka, we even got to show him our version of the Hakka and he was really impressed! Reception have shown they have no fear in tackling our new climbing frame. They have moved around it safely in different ways and thoroughly enjoyed it. We had a visit from the local Fire Service, they let us try their uniform on talked to us about how they keeps us safe in an event of a fire. We learnt so much and they let us all have a go with the water hose, it was so fun!!!! On Thursday 3rd March we all dressed up for World Book Day, even our teachers dressed up! How amazing do we all look in our costumes!? We had lots of fun looking at each other's costumes and reading our favourite books. This half term we have been encouraging children to have a love of reading. As well as dressing as out favourite characters we introduced a reading certificate competition where children achieve different awards, we have had an extreme reading competition with children reading on cliffs, with lizards, in a washing machine, up a tree and even on the toilet!!! I hope this love of reading continues overs the Easter holidays and into the next term, remember to use the fabulous library service based at school.